Even as late as the mid-19th century, and despite a growth in the number of greengrocer's shops, it has been estimated that 95% of Londoners could not afford to buy fresh fresh fruit. Vegetables were more widely available but were priced out of the average working class budget. The working class diet of the time tended to consist of bread, cheese, butter, sugar and only occasionally meat. Potatoes were more common in the diet of rural and agricultural workers. 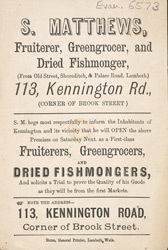 Citydwellers who could afford it, bought their fruit and vegetables from small stores like the one advertised here.